Recently I came across a recipe in one of my cookbooks for Vietnamese Pork and Lettuce Cups that looked incredible. As per usual, the first thing I did was think about how I could turn this scrumptious looking dish into something vegetarian friendly. The usual ideas popped into my head, i.e. using mushrooms or eggplant in place of the meat, but I’ve been wanting to try tofu for a while now and decided that this would be the perfect opportunity. Although I’ve had tofu plenty of times, I’ve never actually cooked with it myself. To be honest, I was a little unsure about how it would turn out and, specifically, whether or not it would mimic the crumbly texture of ground pork, but a quick internet search regarding how to cook tofu gave me the extra boost I needed to give it a shot. The end result was surprisingly good, and although the texture of the cooked tofu did not quite match what I saw in the original recipe, it was nevertheless tasty. Fresh bell peppers, carrots, and peanuts added a punch of color, gave the dish the crunch it needed, and also served to keep everything together in the lettuce cups. The peanuts and bell peppers were not in the original recipe, but paired well with the ginger and garlic and gave the dish a little oomph! I will definitely be trying this one again soon. Start by preparing all of the ingredients. Cooking time is really quick, and you don’t want anything to burn while you’re measuring, dicing, etc. A note about grating the ginger - if it feels tough at first, try turning it. It seems to have a grain to it that you can work with. And don't forget to peel it! Once you have everything chopped, measured, and at the ready, sauté the shallots, ginger, and garlic in the oil over medium heat for about a minute. Add in the tofu and cook for approximately 5 minutes, breaking it apart so that it starts to have more of a crumbly texture. 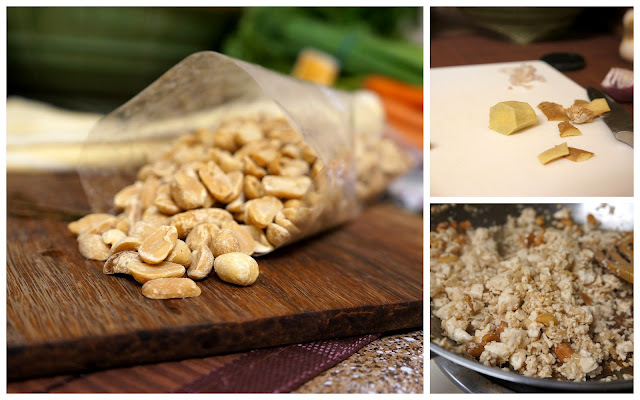 Mix in the peanuts and soy sauce and continue cooking until everything is heated through and the tofu is crumbly. You want the tofu to dry out a little bit, so keep that in mind. Once your tofu mixture is the right consistency, take it off the heat and divide evenly among four lettuce cups. 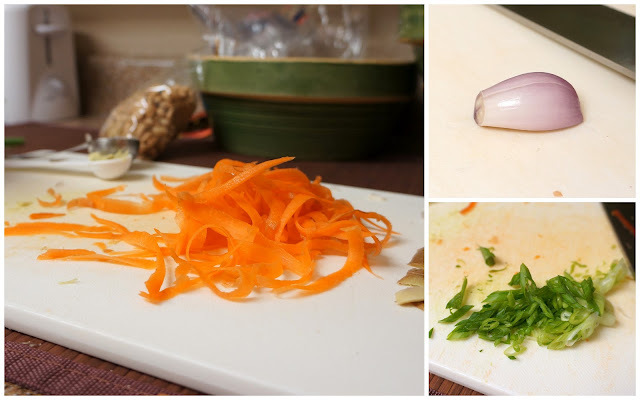 Top with carrots, bell peppers, and scallions, and enjoy! This recipe works great as part of a larger meal, or even as an appetizer (on it's own it might leave you a little hungry). We paired ours with our favorite store-bought veggie spring rolls, but rice would also be a great addition. I was really surprised by how well this recipe turned out. I’ve tried making Asian inspired dishes in the past and the end result is never quite what I imagined or hoped for...awful might be a word used to describe them. I think partly because I’ve used prepackaged sauces and seasoning packets that don’t give an authentic taste and freshness. 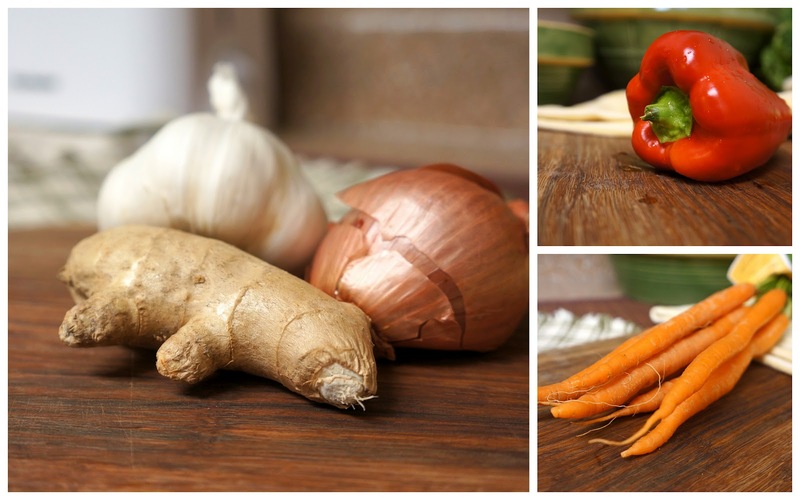 Using all fresh ingredients, and especially using fresh ginger, definitely made a difference here. Overall I liked using the tofu; it was much easier than I expected and really picked up all the flavors. In the future I might try adding chile peppers to give it some heat, and I know I won't be able to resist throwing some mushrooms in there! I hope you enjoyed this recipe and let me know if you give it a try!